Screenprint in colors with glaze on stiff wove paper. 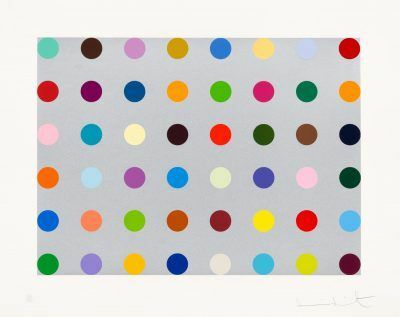 Hand-signed in black marker lower center Damien Hirst. A superb impression of the definitive state, from the edition of 25, numbered in black marker lower left. Bearing the artist’s stamp in black ink verso Published by Other Criteria, London. Hirst’s Psalm prints draw directly from the butterfly collages of his larger gloss paintings. With the butterfly wings separated and ordered in a mandala-like pattern, their arrangement mimics the precision of a collector’s display. Also calling to mind the exquisite stained glass of Europe’s great cathedrals, the wings of these creatures unite the celestial and the earthly to present us with the possibility of beauty in death.